Arizona come in 2nd in nonfuel mineral production in 2017. The US Geological Survey just released the Mineral Commodity Summaries 2018 for 2017. 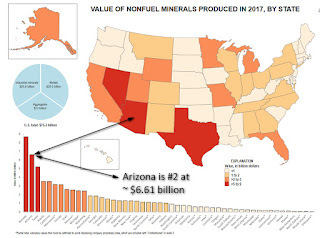 With nonfuel mineral production topping $6.61 billion, Arizona is the #2 state in the U.S. Nevada is a runaway first with $8.68 billion in production. Arizona is at a competitive disadvantage here; gold ($1352/oz) trumps copper ($3.20/lbs) every time.